"Stargate Replicators: simple machines that come together to perform tasks. "Thanks also to Moira, who independently submitted some details about the story; here's a very nice video about the origin of the Replicators from Stargate. 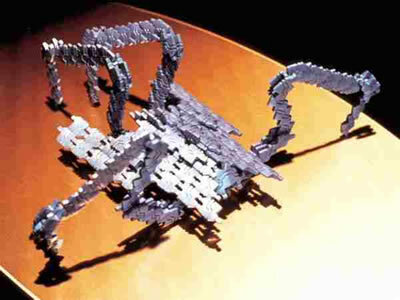 "Standard Replicators are composed of modular blocks, which can be compared to individual computers, that come together to perform several tasks. They have very high interconnectivity, and are able to communicate via subspace to other Replicators who may be light-years away. Every block contains two million isolated kiron pathways, that control the molecular cohesion of all Replicators. These blocks can self-assemble into various larger forms..."
Someone should be sure to drop a line to the SYMBRION project leaders to be sure NOT to program aggression into their symbrions..."
"scary...i was just thinking about the replicators too." "Take a look at these two pictures. The first is from the gallery of "self-healing mini-robots" (I assume this is an artist's concept). 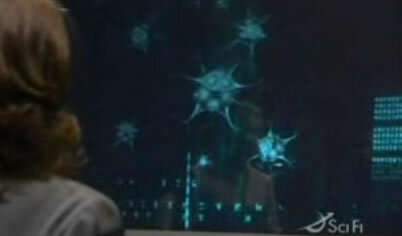 The second is from the video shown above on the origin of the Stargate Replicators. "I can tell you even this! There is actual a European project that is started in parallel with Symbrion, called Replicator. It will use the same hardware, so the connotation you've with the Stargate replicators is not coincidentally. In a few months the website http:://www.replicators.eu should be public. In case you're interested, feel free to drop me a line. 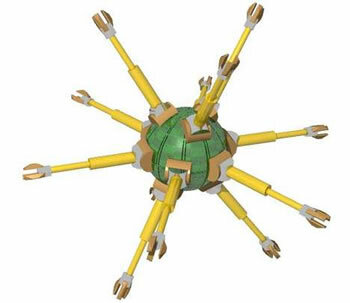 My job as a researcher will be combining all different senses (modalities) such a macro-robot has, as well as proper reconfiguration of the entire organism that makes sense in its environment. you can find me using anne at almende (that's a research company in the netherlands) .com"